American composer Sean Hickey (b. 1970) comes through as a talent to be heeded on the two-work recording of his music, Concertos (Delos 3448). All hands make a fine showing: Dmitry Kouzov, cello, Alexander Fiterstein, clarinet, and Vladimir Lande conducting the St. Petersburg State Symphony. The works on this disk are the "Concerto for Cello and Orchestra," and the "Concerto for Clarinet and Orchestra." This is music that has everything going for it--melodic, heroic solo parts, symphonic breadth, dynamic form and a sort of post-romantic dash. Both were written in the last decade but show the influence of, and absorption in the symphonic concerto tradition from the viewpoint of the present. The clarinet concerto has a bit more chromaticism and an expanded melodic-harmonic outlook but both show ample evidence of craft and inspiration. Sean Hickey has talent and an original take on the music. The performances are first-rate. The Clarinet Concerto was my favorite of the two but there are I am sure many listens to come for me in the years to follow, so check in with me then! Mr. Hickey is for real and the music offers much to the symphonic enthusiast. Give this one your ears! 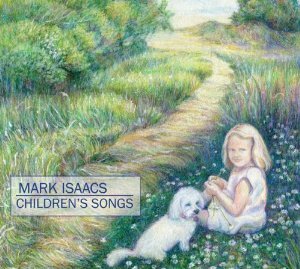 Where solo piano music is concerned, you could say that Mark Isaacs belongs to the modern tonal school. Children's Songs (SoundBrush 1029) finds Mark running through a grouping of 18 interrelated pieces. Without to my knowledge containing an improvisation per se, he nonetheless shows a little bit of jazz flavoring a la Keith Jarrett and Bill Evans, along with the influence of Debussy, in that there are glowing impressionistic expressions to be heard. The music is something children might appreciate, but mostly it is music that shows Isaacs reflecting on childhood as an experience, a state-of-mind, a set of events and images of an exceptional nature. So in that sense it is more akin than not to something like Robert Schumann's Kinderszenen. The music really is what shines. Isaacs has created a reflectively intimate tableau that does not engage in pyrotechnics but nonetheless shows the sure hand of a very creative musical brain and heart. The playing is appropriately poetic; the music revels in dappled sunlight. . . so it's perfect for this season or for that matter any fair day or its memory! Mark Isaacs comes through with 18 pieces you'll no doubt want to hear many times. Excellent piano music. Robert de Visée (1650-1725), born around Coimbra, Portugal, made his name as lutenest, guitarist, singer and theorbo player in the court of Louis XIV in Paris. He left behind him a small but engaging body of published lute music, which Toyohiko Satoh gives vivid voice to on his CD devoted to the composer, De Visée (Carpe Diem Nostalgia 1202). 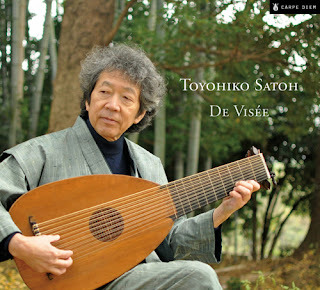 Satoh plays on the recording a marvelous old lute made by Laurentius Greiff in 1610. The music is engagigly typical for very good French School lute music of the period--very lyric, multi-part melody and accompanying counterpoint a prominent feature. Maestro Satoh performs brilliantly, his attention to detail and the beautiful sound of the lute coming through in ways that enchant. This is one of the nicest such recordings I have yet to hear of this sort. Satoh is a master, the instrument has incredible tone and the music is quite beautiful. 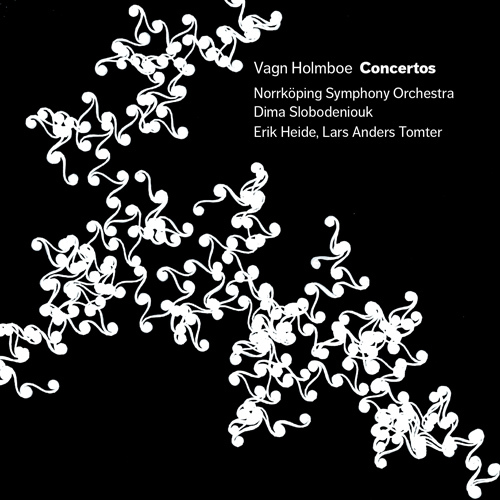 Vagn Holmboe (1909-1996) was the leading Danish composer of his generation, successor to Carl Nielsen, who produced a large body of works that bore his own stamp, and are becoming slowly absorbed and increasingly appreciated throughout the world. Three years ago (August 26, 2010) I posted a review of his complete String Quartets (see link on this page to the Gapplegate Music Review site), which I found quite impressive. Today we turn to a fine disk of three of his Concertos (DaCapo), performed by the Norrköping Symphony Orchestra, with soloists Erik Heide, violin, Lars Anders Tomter, viola, Dina Slobodeniouk, conductor. There are three works represented, the "Concerto for Viola, op. 189" (1992), the "Concerto for Orchestra" (1929), and the "Concerto for Violin no. 2, op. 139" (1979). These are works that have a great deal to recommend them, whether written rather earlier in his career as the Concerto for Orchestra, or towards the end, as the other two. Holmboe writes music that belongs to the last century. The concertos are not as much neo-anything as following a personal muse. These works generally show a respect for classical forms but incorporate a thematic expressivity and folk and chromatic-harmonic elements not characteristic of earlier eras. Vagn Holmboe has his own way and the concertos are very inventive and well-wrought, requiring some time to digest and appreciate, but then rewarding patience with a world of music one is glad to linger within. This is high-caliber music, showing the composer as a man of genuine talent and originality. The performances are pristine on all counts with excellent solo dynamics, nicely staged orchestral dramatics and a program that bears close scrutiny. 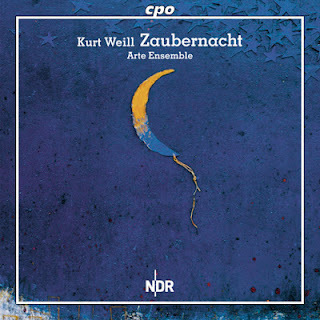 The original orchestration for Kurt Weill's Zaubernachte (Magic Night) (1922) for soprano and eight chamber musicians, was lost for 80 years, rather miraculously turning up in 2006. A critical edition of the score was subsequently made available. The Arte Ensemble has made a full recording with Anna Vegry in the brief soprano role (CPO 777 767-2) and the CD is now available in the States. Zaubernachte was written as a children's pantomime and thus has a literal fairy-tale sort of story line the music goes along with. The original scoring includes string quartet, winds, percussion, piano, a kind of miniature orchestra well-served by Weill's score. The music is typical of Weill in the earlier period in that there is a bit less of the vernacular ragtime/jazz/cabaret influence than later on. This music is nonetheless quite playfully lively, in an almost neo-classical vein but with the tang of the modern on the palette. Fact is, it is music that delights in every way. The Arte Ensemble gives a detailed, perfectly idiomatic performance that sounds great on disk. This will be manna to Weill enthusiasts (like me). And it is fully engaging as a work in its own right. Those who are delighted by such things as Stravinsky's "Tango" (and who isn't?) in its chamber version will fall right in with this music. It's pure charm! Not every composer of the 20th century occupies a secure and well-defined niche, of course. The composer Percy Grainger (1882-1961) is perhaps one whose reputation has yet to solidify, at least in my own head. He is a precursor to Britten in some ways, a sort of lesser Vaughan Williams, perhaps. Or is he? His piano music seems very English, folk-based at many points, somewhat impressionistic at times, creating a kind of down-home aura Anglophiles appreciate, but not always the general modern classical listener. Ironically however he was born in Australia, lived only 13 years in England, and spent the vast remainder of life in the United States, from 1914 on. So he isn't quite English in terms of pedigree, yet he seems to belong musically to that locale in spirit. And what of his work with larger aggregations? I'll admit I have been until now rather ignorant of it. Now there's Sir Andrew Davis conducting the Melbourne Symphony Orchestra in a solid set of examples, Works for Large Chorus and Orchestra (Chandos). These are premiere recordings (some of them anyway) and there are ten brief to mid-length compositions to be had. Certainly no fault can be found in the performing artists. They come through with very spirited and appealing renditions. As for the music you once again get a get a good bit of folk-song adaptions, arrangements and compositions that reflect such roots. These have strong attraction for the most part, although I cannot say I was overly enamored with the piece based on "Camptown Races". There is a huzzah factor at work here that can be rousing. Get a large chorus and orchestra and give them something well put together and exciting, you get something that gives pleasure. Sometimes it's like hearing Ives without the Ivesian or Vaughan Williams without what made him quirkily himself. That isn't to say there aren't personal twists and turns of Graingerian personality in there, they just don't seem very out front. In short I still don't find myself convinced that we have a titan of the century at work here. And perhaps that doesn't matter. We do have a very well performed sampling of his works for larger aggregates of singers and a full orchestra. We have time to listen, enjoy, and ultimately decide for ourselves about his music. And so Davis and company have done us a great service, and at the same time given us a full CD of music that we can enjoy and explore. Solo piano music in the classical realm has its own trajectory, compared with orchestral or vocal music. The shading and color of the music can be distinct of course, but the nature of the pianoforte lends itself to intimacy, to the nature of the notes and harmonic content in a more unified, direct way, and of course then how it all is shaded by the composer and in turn the performer. The result of this is that a composer may show a very distinct side of him or herself in solo piano works. 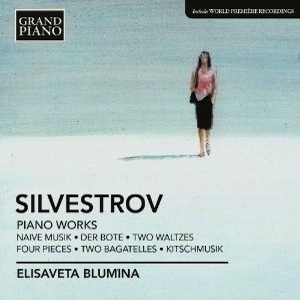 In the case of Ukrainian composer Valentin Silvestrov this seems very much so, as heard in Elisaveta Blumina's very lovely rendition of select Piano Works (Grand Piano 639). The disk covers a long period of the composers' ouevre, from 1954-55 (rev. 1993) through to 2011. In contrast to the works for larger forces (some of which I have covered on these pages in the recent past), he seems to glance backward more continuously and to some peak periods in the stylistic canon of solo piano music. So we get some beautiful music that touches strongly upon classical Mozartian, romantic Schumannian, Brahmsian and Chopanesque, and Debussian, Ravellian and Satiean moments, all as recalled in a dream, or in other words as refracted by the musical equivalent of light, water, air, and memory. It's a beautiful lyric set of works, given a supremely sympathetic performance that enters deeply into the world of the music. It's piano music that could have been written 100 years ago or even more, that would not seem out of place in such a period. It in a way involves a refusal of the world of modernity, a very gentle one. And one most certainly gets the feeling that the music is what Silvestrov felt as he sat down to the piano, that it flowed out of him naturally, unforced. I say that because the musical language sounds so "native" to the composer. Performance, music and production are of the highest levels. The music is so pleasingly engaging that it will appeal to just about everyone if they give it a chance. Music that dreams of other eras may have to emerge from that dream someday, but perhaps not, perhaps it will go on with the dream forever. Either way, Silvestrov shows himself possessed with the spirit of the time before ours in this music. We follow the path and revel in the sounds, knowing all too well we must return to the present. The music, perhaps, will ever stay in its limbo world, where we can return to it at will. A most unusual disk and quite beautiful! An old boss of mine, who was good to me, was surprised when I told her that Rachmaninov lived in the 20th century and died in the '40s. She thought he belonged to the century preceding the 20th. It is not surprising, especially if you are familiar with some of the piano pieces and his concertos. Essentially he did belong to the late 19th century in spirit. Unlike his compatriots Stravinsky and Prokofiev, he was never really involved with the modern fashions so much a part of his era. He was very much into a Russian sound, regardless, and in the end his music was so much his that none of it really mattered. This is as true of his Symphony No. 3, op. 44 and the Symphonic Dances, op. 45 (Naxos 8.573051) as of any of his works. And the Third Symphony is essential to his output. 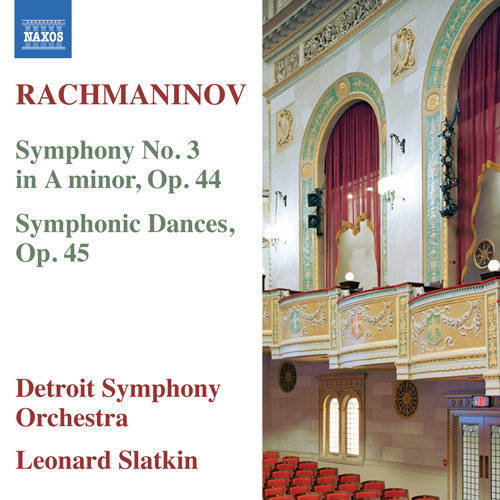 Grand Doyen Leonard Slatkin conducts the Detroit Symphony Orchestra in recent performances of the above works in a nicely produced budget version on Naxos. The orchestra under Slatkin gives very detailed renditions of the works, with strongly defined and balanced wind/brass parts and a slightly less predominant string section than can sometimes be the case, especially in some classic Russian renditions that I am used to hearing. This took me a few listens to get acclimated to, and now I must say I find the disk quite worthwhile, not less impassioned than the versions I have heard on timeless occasions, and in a way more sympathetic to the entire gestalt of these works. The symphony has strongly cohesive and memorable thematic development, and surely belongs as one of his very greatest endeavors, though his Second sometimes has gotten more general coverage because of in part an attractive theme that entered popular music last century. The first symphony has a most youthful dash and slightly frenetic demeanor which has over the years given me much pleasure. But it is the Third that in the end takes the brass ring. The Symphonic Dances contain a great deal of fantastic music as well, especially in the folksy-brilliant Slavic drive of the first movement. Slatkin handles it all well and the orchestra does not flag, though this may not be the definitive version. Again however, you get an excellent balance of the overall orchestra in the soundstage. If you are on a budget (and who isn't these days?) you are royally served by this Naxos release. And for those who already have a number of versions of these works, Slatkin/Detroit give you another take, well-worth your time and effort. When all is said, the music a composer writes is not just the product of where he or she is from. Theodor Grigoru is a case in point. He is Romanian. 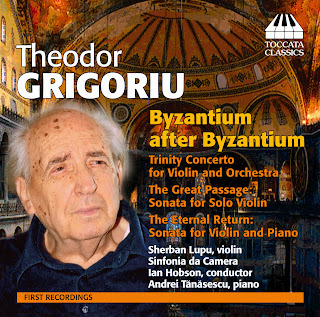 Yet his music, at least the music contained in Byzantium after Byzantium (Toccata Classics 0131), hits the listener on reflection as having an overall thrust as much international/Eastern as specifically Romanian, at least to my ears. Perhaps that is due in part to the works contained in Byzantium after Byzantium. They are thematically related in extra-musical content--as three works that meditate on what survived of Byzantine culture after its political disappearance ages ago. The composer describes it as in part the pervading persistence of Byzantine liturgical music in the Orthodox service (or more poetically, as "angels singing") and by implication the persistence of Christianity from Byzantine roots in the East and beyond. So then in this way the composer, who serves much more than the ethos of his homeland, situates himself in a wider horizon. The series of works captured on the disk at hand began as a commission from the Trinity Episcopal Church in Indianapolis in celebration of the 75th anniversary of their rebuilt cathedral. The commission came at a time when all of Eastern Europe was being transformed with the collapse of the Eastern Block political system. Naturally change, persistence and transformation were on Grigoru's mind. Enough of the background details. You can read all about it in the liner notes booklet that comes with the CD. In any event the first work in the series was completed in 1994, and named "The Trinity Concerto." The second, "The Great Passage," in 1999. "The Eternal Return," the final work in the series, saw completion in 2004. These first recordings take the three works in their intended sequence, chronologically as noted above. The solo violin part is handled in rather spectacular fashion by Sherban Lupu. For the concerto he is ably accompanied by Sinfonia da Camera, Ian Hobson conducting. "The Great Passage" is for unaccompanied violin, and "The Eternal Return" is in the form of a sonata for violin and piano, Andrei Tanasescu taking the latter part. This is highly virtuostic violin music with much in the way of expressive fireworks that have a Romanian intensity. 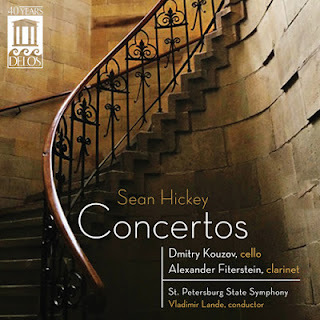 The concerto pits this against well-conceived orchestral expansiveness of a harmonically evolved and sometimes somewhat mystical nature, with a kind of melancholy at times and much in the way of chromatic movement. "The Great Passage" in many ways continues the musical journey begun in the Concerto, almost as a supremely extended cadenza for the violin. "The Eternal Return" acts as a kind of reaffirmation. Violin and piano engage in some beautiful cantabile, then modern-chromatic thrusts of drama and harmonic flow and flux. It is a bristling work of inspired abandon, dissonant motion, energy and complexity. You end up in this sequence being quite impressed with the singularity of Grigoriu as an original voice of depth and complexity. It is music that takes some time to absorb. In fact there is so much to internalize that I must admit I still need time to assimilate what he has accomplished. I do know that this is music to grow into--sublime, difficult, yet beautifully expressive. It's a bit of a blockbuster. The performances are seemingly definitive. Lupu, the orchestra and Tanasescu excel in their interpretations of the music, especially the violinist. 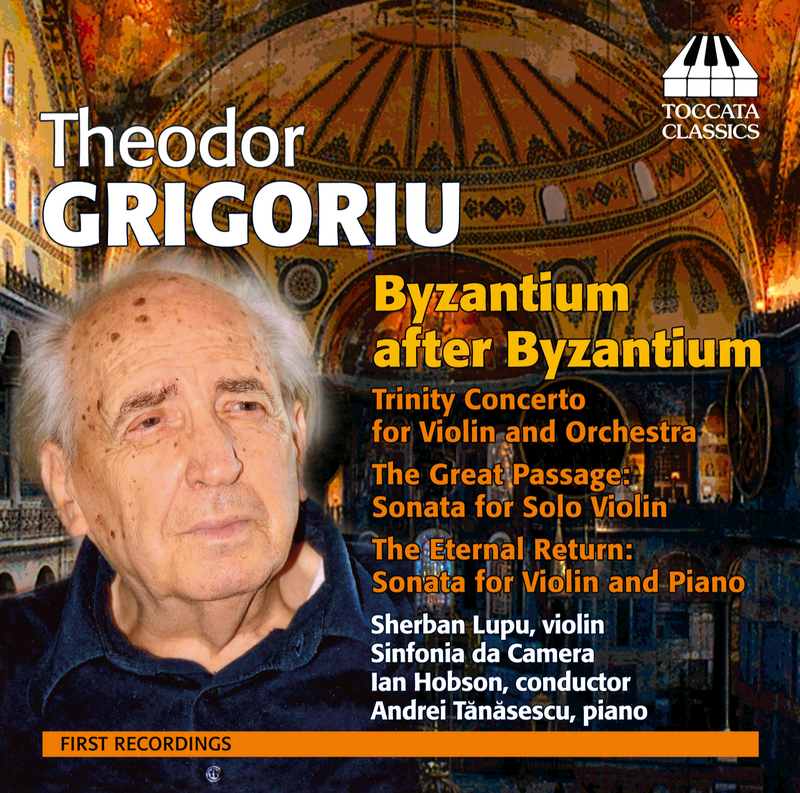 It is clear that Grigoriu is an important force in Romanian music, the heir to Enescu's fire, his modern counterpart, yet wholly intact in his own right. Give this one a close listen! American composer Kenneth Fuchs was in some ways an unknown quantity/quality for me until I started to listen to his new CD of chamber music, String Quartet No. 5 ("American"), Falling Canons, Falling Trio (Naxos 8.559733). Now that I have listened to the CD more than a few times I can say that I DO know his recent music. This is the sort of album that seems to well epitomize what a composer is about. And Fuchs' music is singular enough that what is going on in his music stands out with a kind of hard-drawn clarity. The Fifth String Quartet runs about a half hour, with one long movement centered around a theme that winds along at some length, descending rather slowly in a jagged fashion. The theme has a minor key tonal center and in some ways to me sounds not exactly American in some prototypical way. What does hit me is the quality of the contrapuntal and harmonic thematic development. For this quartet shows its structure as the interior of a building would if one were to see all the beams and supporting architectural features. There is dramatic theme and variations form with a fantasia-like freedom at times, a rigorous four-way interplay with free-flowing contrasts, followed by a change to diatonic major, a more countrified Americana feel, and an exciting allegro pitch to the finish line. The Debray String Quartet sounds great in their performance of what is a very pleasing, moving piece. The other two works on the program relate to each other as offshoots of a previous work, "Man Falling," written for baritone and orchestra after Don DeLillo's novel touching on post-9-11 issues. The "Falling Canons," in seven movements, works out some brilliant counterpoint for solo piano, based on a theme from "Man Falling." There is a set of intricate variations, canons, developed out of the chromatic falling theme motif. Christopher O'Riley shines in the solo role. "Falling Trio" works out an expanded color palette made available by using a piano trio (piano, violin, cello). The same falling theme is again the basis for the one-movement work, and there is a mix of homophony and polyphonic counterpoint for a slightly less rigorous but more meditative and expressive result. There are moments of late romantic feeling that descend upon the music towards the end, with the jagged chromatic and minor mode descending that link this work with the two previous. It is elegaic in the end, and in this way we have a resolution of the contrapuntal tension that has built up. A penultimate, dramatic set of accented figures leads to an even more elegiac mood. Cascading piano, complemented by long-lined, long-toned figures in the strings leave us grounded, feeling moved and, perhaps, rather transcendent. Trio21 are exemplary on this piece. When the music is finished and silence reigns (as much as there can be such a thing where I write) one is left with the feeling that a presence has gone, that as much as music can say what words cannot, that all has been said, that more would add nothing to what has been expressed. Fuchs delivers an extremely powerful punch with these three works sequenced as they are on the CD. The triumvirate of sounds acts as a kind of monumental remembrance in musical terms. This is a high form of discourse indeed. Recommended! Wolfgang Rihm has become a living composer of high worth, to my mind, an extraordinarily creative musical voice, a man who engages tradition but never is subsumed by it, an original, a modernist for all times. 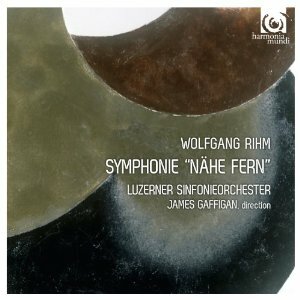 So it is only natural that his Symphony "Nähe Fern" (Harmonia Mundi HMC 902153), enjoying its world première recording this week by the Luzerner Sinfonieorchester under James Gaffigen, draws upon a Goethe poem and the four Brahms symphonies for its inspiration and source wellspring. "Nähe Fern" translates literally into "Near Far," and alludes to a line from Goethe that in English might read "Twilight has fallen from above, / Already all nearness is distant." The symphony falls into four movements, each a kind of preface to a Brahms symphony. Interjected after the first movement is the Rihm-Goethe song that is based on the poem alluded to, "Dämmrung senkte sich von oben," originally for voice and piano but reworked by Rihm for the symphony orchestra and baritone Hans Christoph Begemann. It stylistically blends with the symphony completely, so that the sequence seems natural and desirable. Interjected into the musical flow within the symphony are allusions, musical quotations and paraphrases from the four Brahms works. Some passages are quite recognizable, yet brilliantly transformed, others lay seemingly cloaked under Rihms' own inventions and transformations. Backgrounding now accomplished, we can turn to the music itself: it is richly symphonic, a modernist analog of sorts to Brahms' expressively thick romanticism, near in that way but "become distant" with the twilight domain of Rihm's own presence and personal sensibilities shining forth in the world of the 2010's. It is then idiomatically Rihm's, the tonality and texture expanded because that is what the composer hears. There is a wealth of thematic material handled with Rihm's unique symphonic gift, rather gravitas, deep, moving yet partially concealed, as it were. It is profoundly and characteristically a music for today. In that way it is a brilliantly dark work, rather brilliantly realized by Gaffigen's sure hand and the concentrated weight of the Luzerner Sinfonieorchester. Rihm epitomizes here the age we are in, our technology outrun our humanity, for a lived experience and music no longer the product of an abstracted, smoothly realized innovated modernity, but subject to submergence, to a new expressivity, a twilight of ages past awaiting another dawn. In that wise we remain mindful of the heritage we share but find archaeological depth intervening between the past and the now. Perhaps. The recording should further distinguish Rihm, surely, as one of the master-composers of this still quite young century. It feels like a work that will have staying power. Brilliant and highly recommended! As omni-present as the guitar has been in the rock arena, it has on the whole had a much lesser presence in modern classical music, especially in multiple incarnations. 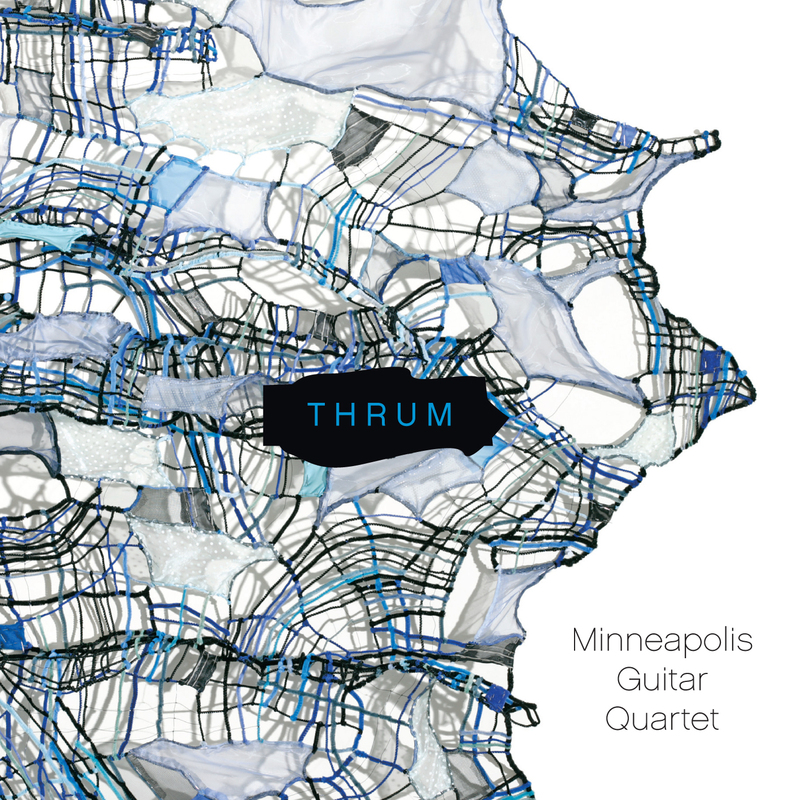 A most pleasing exception to the general rule can be heard with the Minneapolis Guitar Quartet and their recent release THRUM (Innova 858). They treat us therein to four compositions in a contemporary mode, all for the quartet. Not surprisingly the foursome play nylon-stringed acoustic models, and they do so with an excellent ensemble blend. For the final work on the program composer Gao Hong makes a guest appearance on the Chinese pipa. The album gets off to a lively start with "Ghetto Strings" by Daniel Bernard Roumain. Each movement is named after a neighborhood, city or locale associated with the word "ghetto." So we have "Harlem, " "Liberty City," "Motor City," and "Haiti." The various movements combine a local style associated with that area and an overarching concern with repeating ostinatos, motive and/or "riffs," and a heightened rhythmic interaction between the four performers. It is music with an original bent, an identity that goes beyond locale and into a kind of meta-commentary. 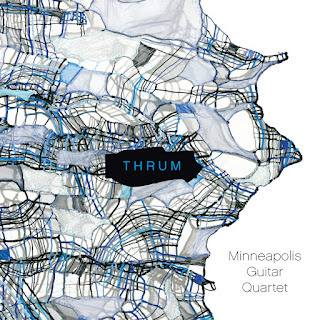 The title work "THRUM" by David Evan Thomas builds on a contrapuntal texture and interesting, melodically distinctive part writing. This work especially reflects a contemporary take on idiomatic classical guitar soundings and becomes quite ravishing and inventive in the process. Van Stiefel's "Cinema Castaneda" uses vivid colors to depict ten cinematic scenes, with the playing of the quartet rather spectacular in its varied evocations. Finally Gao Hong's "Guangxi Impression" draws upon traditional Chinese music in the unusual combination of the four guitars and the pipa. Unconventional guitar articulations, knocking, pulling at strings, etc., contrast with the distinctive sound of the Chinese lute for an impressive final go-round. The quartet leaves an excellent impression in the end. They are masters at forming a cohesive ensemble sound and bringing out sound-colors of a broad range. The emphasis throughout is to strive for a musical end, rather than to showcase technique per se. The composers and the quartet in this way unite for a program that goes a long way in establishing the ensemble as a premiere unit of its sort. May they long thrive, and may they continue to attract and discover contemporary compositions that do them the full justice that these works do. It's a delight to hear this album. I do hope that they get the broad recognition they deserve with this music. Sampling has been a huge part of the music worlds of hip-hop, some pop, some rock and a little electronic jazz since the technology became widespread in the '80s. Of course, as an analog or later as a digitally realized sound source it has been part of the classical avant of electro-acoustic music since the first tape recorder pieces in the very late '40s and early '50s. With all that there have been only a handful of composers who have managed to make a consistently sustained, coherent dialog out of the sampling of world, hip-hop, rock, jazz and classical elements who combined that with live instrumentalists. 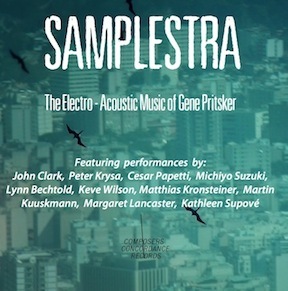 One of those most certainly is Gene Pritsker, especially in the very latest release of his, Samplestra: The Electro-Acoustic Music of Gene Pritsker (Composers Concordance 0011) coming out this month (towards the end of it). On it we have 14 relatively short works, each devoted to a series of samples that form a kind of orchestra. For each work a soloist (or in one case a trio of soloists) performs live over the samples with parts that are either mostly or wholly written out, with several that feature some improvisation as an important element of the mix. So we have pieces featuring John Clark's horn, Peter Krysa's violin, Martin Kuuskmaan's bassoon, and Gene himself on electric guitar, among others. All do a fine job. What makes it extremely interesting is the abundance of good compositional ideas and their realizations. As alluded to, there are some sample segments that feature rock and hip-hop beats, plus classically oriented, world derived, rock- and jazz-oriented melodic-harmonic sounds. The dialog between live soloist(s) and samplestra is virtually uniformly cohesive. It's music that has the tang of the modern, the spatial wooziness of soundscape electronics at times, but then a neo-baroque interaction at times as well, not so much conventional counterpoint as a contrapuntal give and take between the elements. As music, which ultimately we of course evaluate anything new on the basis of, it hangs together remarkably well. Don't try to pin it down stylistically but let it take you where it may. If you do that you will find an enormously stimulating program. This is the sort of thing Gene has been working on for some time, and he has gotten extraordinarily adept at juggling the elements and making it all very cohesive and very musical. Brilliant! It must have been an exceptional experience to attend one of Schubert's "Schubertiades," congenial gatherings of friends dedicated to running through some of his music. It must have been magical. His lieder of course were often on the agenda, as were vocal duets, trios and quartets. There is a new recording that features all these combinations, understandably titled Lichte und Liebe: Lieder & Vocal Quartets (Harmonia Mundi 902130). It features the voices of Marlis Petersen, Anke Vondung, Werner Güra and Konrad Jarnot, with piano accompaniment. The recording is excellent. It gives you spirited performances of music that is like none other. Sometimes operatic, sometimes more intimate, the music is performed with care and bravado. 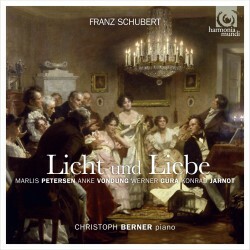 Anyone who revels in Schubertian lieder will welcome the recording and a glimpse into Schubert in an inspired, relaxed mode. Performances are just about as close to definitive as any. So do not hesitate. 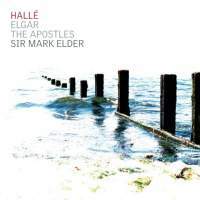 HALLÉ, the full orchestra, chorus and soloists under Sir Mark Elder have undertaken to record Elgar's oratorio The Apostles (Halle 2-CD HLD 7534). They've done something extraordinary, in fact. There have been excellent recordings in the past of his later oratorio The Dream of Gerontius, but never have I heard such a stirring Apostles. It's won a number of awards across the pond, so I don't believe I am producing any kind of surprise in my review today. The music has an endlessly inventive quality, but it's perhaps only in such an inspired performance that it comes across to the listener as exceptional. This is a spectacular version. The chorus sounds especially beautiful, but soloists and orchestra make for a very moving and fully rounded reading. Sir Mark Elder brings out the drama, the dynamics, the finely differentiated parts, in a mode that is appropriately heroic. Clearly Elgar meant this work to sound, and sound it does here. The depth of soundstaging comes through with exceptional detail and clarity. In all ways this is a triumph! 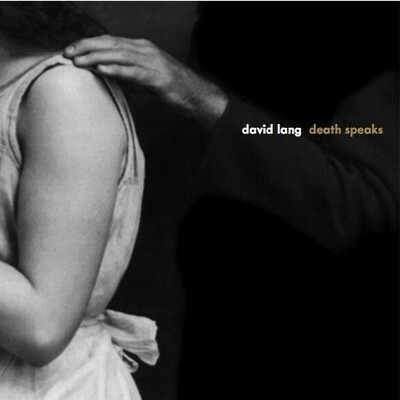 In the realm of the "memento mori" paintings, Nico in her classic dark period, and Medieval-Rennaissance art song comes David Lang's Death Speaks (Canteloupe). It is a several part meditation on death inspired by Schubert's "Death and the Maiden," though Lang's opus sounds nothing like it. The small instrumental chamber ensemble of electric guitar, violin and keyboard-piano (and bass drum) weaves a langorous web of post-modernist cyclic motifs while Shara Worden (joined toward the end by Owen Pallett, who also plays violin on the recording) sings a lovely set of poetic lyrics on Death personified and the goodbyes to life that have resonance with such early music composers as Giullame Dufay. It is hauntingly painful, lovely and dark. A second work, "Depart," concludes the program with suspended, wordless long-toned vocals and multiple cello parts. It drones and motives recur with mystic insistence. In short this is David Lang at his best. It is gloriously dark music, and a clear step away from anything predictable in the new music scene. It occupies its own space like a tropical island surrounded by sea. Lang is essential today, and this is a key work. Richard Cornell is another somewhat new name to me. He composes music of a stirring modern sort, with a kind of motion and vitality that generates a good deal of ear-interest. His sixth album, Tracer (Ravello 7869) presents four substantial chamber works, in each case recorded live. There is "New Fantasias" in four movements, "Tracer," "Images" in two movements, and "Acqua Alta" for solo violin, in two movements. The chamber orchestra A Far Cry handles the first work, Boston Musica Viva under Richard Pittman the middle two, and Peter Zazofsky the solo violin part on the last work in the sequence. There is something post-Schoenbergian, post-Webernian to this music. It has the widely ranging melodic quality of the Viennese School, but the rhythmic quality is a bit more driving, more Stravinskian at times. The performances are excellent, and the music is not so much derivative as extended, like a set of lucid dialogues on subjects others have handled before. The program, I suspect, will appeal to all those who admire 20th century modernism and would like to hear development in the classic modes of its music. 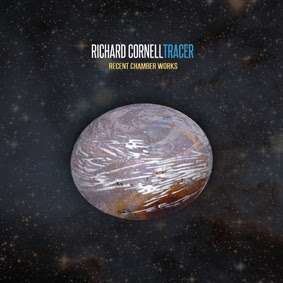 Richard Cornell has a genuine voice of his own in this stylistic universe. The album excels in bringing that voice to us in all its charm and eloquence. 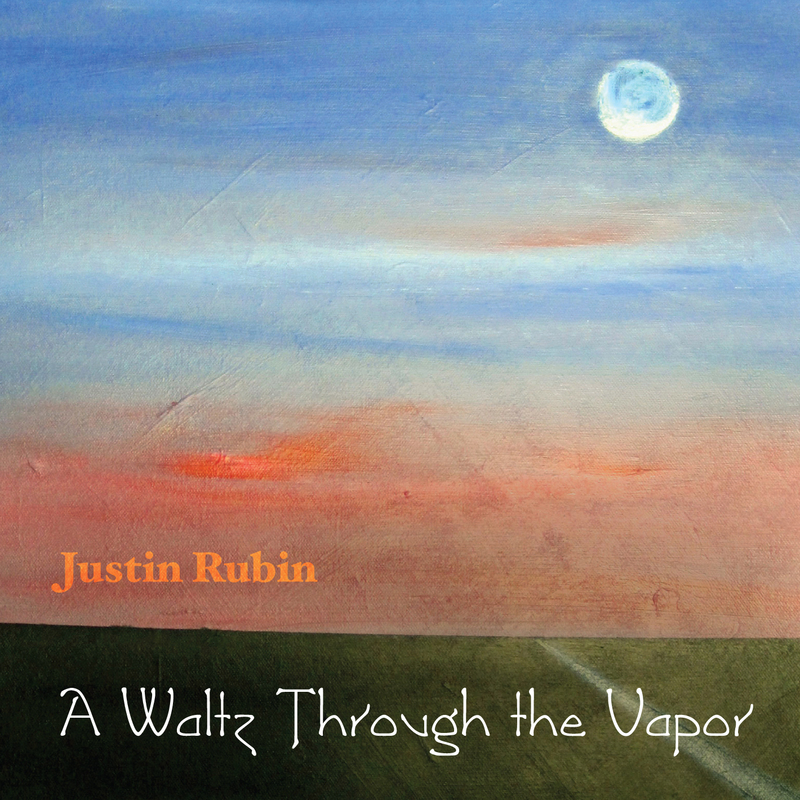 Justin Rubin teaches and resides in Duluth, Minnesota. 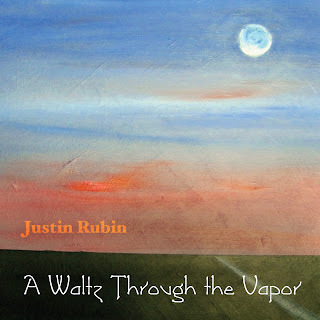 His experiences there, natural and social, have something to do with the chamber music heard in his second album, A Waltz Through the Vapor (Innova 847). The lived-time of place as influence follows in the case of many composers, and in this instance as elsewise, the results are what we seek. Here they are quite noteworthy. The magnetic center of the music and its performance on the album rests with pianist Matthew McCright. He gives dramatic, poetic life to the fair number of piano solo pieces included. There are also works that require larger forces. There's one for bassoon, marimba and piano, one for flute and piano, and two for cello and piano. For those, other pianists take on the parts, and do a fine job at that. Piano remains central as an element in the music at hand, at any rate. The works tend to be short, evocative, textured somewhat densely and harmonically in the late romantic-early modern camp. There's the sort of rolling expressivity you can hear in Ives, Sorabji, Scriabin, only personalized as Rubin-musique. The performances, especially those by McCright, are warm, impassioned but also precise and detailed. This is music that sticks in the mind after a while. It is a program of well-paced chamber music that has density and drama, that has memorable content. Listen to the familar yet transfixed Variations on "There Were Three Ravens" for flute and piano as a good example. The familiar (in this case the Renaissance theme) combines with the inventive in ways that stand out. Justin Rubin has that knack. A Waltz Through the Vapor puts it across very well. One thing you can count on with the Navona family of labels: they put out an ambitious monthly release schedule filled with the music of contemporary composers that may not be receiving a great deal of exposure, yet are often quite worthy of consideration. 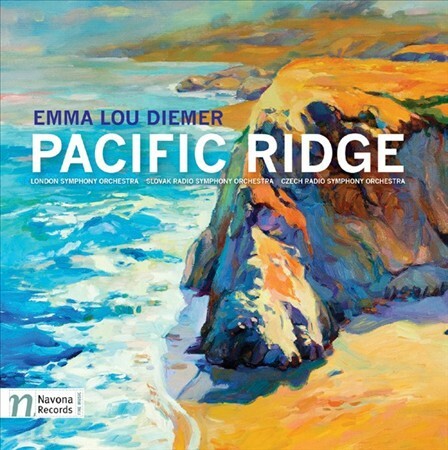 One such release is Pacific Ridge (Navona 5898), a three work introduction to Emma Lou Diemer. An overture and two concertos for soloists and orchestra are on the program. Ms. Diemer (b. 1927) resides in California, for that she may be envied given the recent winters and their chill factors here in the east. Her music has some of the spirit, panache and personalized Americana of Gershwin and Bernstein without any direct imitation. The three works are "Santa Barbara Overture" performed by the London Symphony under Brynmore Llewelyn Jones, "Concerto in One Movement for Marimba" with Nathan Daughtrey taking on the solo part and the Slovak Radio Orchestra under Joel Suben supplying the orchestral punch, and finally the half-hour "Concerto in One Movement for Piano" with Betty Oberacker at the pianoforte, accompanied by the Czech Radio Symphony, Vladimir Valek conducting. All three works have single-movement dynamic thrust, a sure handling of the amassed musical forces, and the personal stamp of Ms. Diemer's musical vision. This is music of a directly communicative kind, modern in the expressive and harmonically evolved senses, a hint of jazziness at times, rhythmically active and filled with shifting moods as a seascape, turbulent, choppy, becalmed, freshet driven and rollingly consistent in turns. The solo parts are well handled by the principals, the orchestral performances leave nothing to be desired, and the music has a solidly cosmopolitan appeal. Here's one that's easy to like.